Oppo deal heads up: if you’re looking for a cheap and not-crappy unlocked Android phone, Newegg has the unlocked version of the ZTE ZMAX 2 for $120 after a promo code. Sorry, deal’s expired, but it’s still a good, cheap phone! It’s not a particularly fancy phone, but it seems to be a well-realized package that people like, according to what reviews I could find. It’s got a 5.5” 720p screen, Snapdragon 410 CPU, 2 GB of RAM, 16 GB of ROM, mostly-stock Android 5.1, a big, removable battery, and a microSD slot. My gf has an old Pantech Discover she’s wanted to replace, but she just bought herself a treadmill (long story) and isn’t making any other big purchases for a while. She wants a phone with a bigger screen but otherwise doesn’t need anything fancy. So I grabbed this ZTE since it’s cheap enough to be a borderline impulse purchase and given as either an anniversary (on Dec 20) or Christmas present, while being a nice upgrade for her to a more modern phone. Which now brings my total Black Friday/Cyber Monday spending up to a pair of sneakers and hoodie for myself, and this phone for her. I’m such a big spender. UPDATE: The phone has arrived, and I gave it to my gf as an early anniversary present, since her old phone is all old. She’s extremely happy with it. The specs aren’t fancy, there’s no NFC or 5 GHz wifi, but it’s got an almost entirely stock build of Android 5.1.1 and runs nice and smooth with no issues. Only having to render stuff at 720p resolution probably helps keep it from getting bogged down. I’ve played with it and it’s a totally decent phone especially for how cheap it is. The 720p screen is at least nice and bright and clear with good colors and you don’t really notice any pixels. Obviously, this phone is not as nice as my Moto X Pure Edition, but it’s only like 1/3 the price. If you just want a basic, totally-functional Android phone with a big screen, I can totally recommend it. Now, the bad news: Newegg is all sold out at $119. As it sits right now, the best price on the unlocked ZMAX 2 is $164.95 through a couple of Amazon third-party sellers. 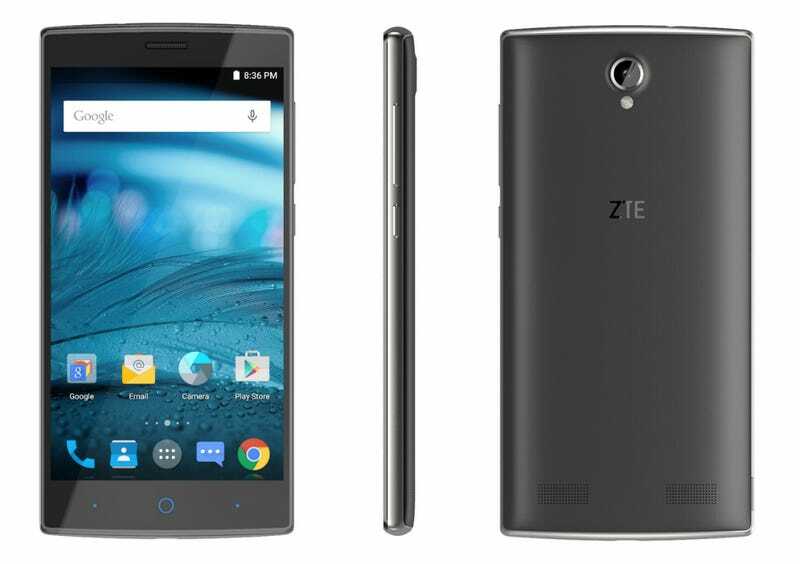 If you have AT&T, or use an MVNO that piggybacks on AT&T’s network like Straight Talk or Cricket, you can get the AT&T GoPhone branded version of the ZMAX 2 for $129 at either Walmart or Best Buy. It should work fine with any AT&T-compatible SIM card. You can just buy the GoPhone version and not activate the GoPhone service. So really, if you want a cheap phone with a big, totally-ok screen, and mostly stock Android Lollipop (who knows about future updates) this is a pretty solid pickup for the price. Keep an eye out for deals and maybe it’ll get cheaper again.